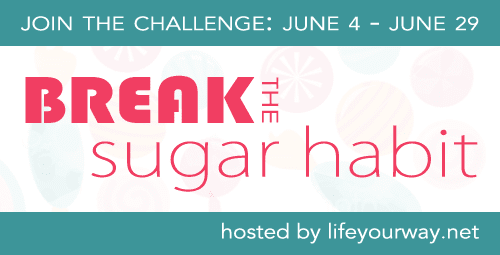 The Break the Sugar Habit Challenge doesn’t officially start until Monday, but the hard work begins this weekend! Decide how your family will participate in the challenge. Will you be eliminating all sweeteners? Just refined sugar? Are you going to participate for the whole month or just a week or two? Clean out your fridge and pantry. For the greatest level of success, I highly suggest packing up the sugar in your home so that you’re not tempted to cheat. You may want to finish up any snacks and then pack your ingredients away in a storage bin for the duration of the challenge. I am debating giving away my refined sugar altogether so that I can’t go back to using it once the challenge is over! Decide on any exceptions. I will still be adding a couple drops of liquid stevia to my daily apple cider vinegar water, although I’ve decided to cut the number from 5 to just 2 so that it’s not too sweet while I’m trying to recalibrate my taste buds. This cheat is worth it to me because I drink ACV for its health benefits, and stevia is a very healthy choice as far as natural sweeteners. Make your lists. The secret to any diet change is having lists available of what you can eat. I recommend making lists with as many meal and snack ideas as you can come up with so that you don’t feel discouraged by the limits on your diet during the challenge. I’ll be sharing ideas as well, but the earlier you start on this list, the better position you’ll be in. We have a crazy weekend ahead of us (and won’t even be home for most of it), so I’m a little nervous for Monday to come. If you’re in the same boat as me, start by cleaning out your fridge and pantry and then check back here first thing Monday morning because I’ll be sharing our meal and snack lists with you! We had a little “sugar dump” this week and it was kind of fun! The leftover candy from a party was tossed in the trash, amidst cheers from three little girls. All sugary cereals, breads, and snacks were either stored or thrown away. I ate the rest of the Kit-Kat bar I had stashed in the fridge. Ahem.